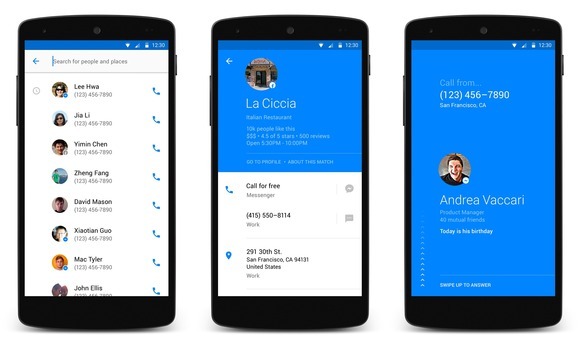 Everyone may be familiar with Truecaller and Google Dialer applications. They helped their user to know the name and location of the caller. Nearly a month ago rumors came out about the new app from Facebook which would provide the same service as Truecaller and Google dialer does. Now it became official when Facebook came out with its new caller ID and dialer app called “Hello”. The company officially made the application available on Google Play and can be downloaded at free of cost. But for the initial period the application is made available only in United States. Another annoying thing is that Facebook hasn’t said anything about making it world-wide available. Product Manager of Facebook, Andrea Vaccari, wrote in a blog that users of handsets are receiving a number of calls to their unique number. But unfortunately, information about many of them is unavailable to the user. He added that Hello integrated with Facebook could deliver information about the person who is calling you. He also wrote that it would help in blocking bogus calls and provides the option to locate people and their places. It is stemmed by Facebook’s messenger team. When they developed they integrated the app with four relevant functions which makes it distinct from other similar applications. The first among the list is the app is programmed in such a way that it automatically search for unknown callers. The second is that it explores for the information about people and their business from Facebook. The third function is that it has a mechanism to block unwanted calls. The fourth one is it helps in making VOIP calls with the help of messenger. Based on the info provided by Facebook, The application utilizes the information provided in the Facebook profile database and identifies the callers. But the company declared that no one’s privacy will be harmed. Informations of those who have made their personal information public and whose personal information has been shared will be available to you. All other’s personal information will not be revealed at any cost. Another thing to clear about is the call block facility. This app permits us to block particular numbers right in the settings. If any calls comes from those blocked numbers they will be automatically transferred to voice calls. This will help the user to review those calls if they want to. How Hello does outshine other similar apps? Hello will poses a serious threat to already existing apps in the same category such as Truecaller and Google Dialer. Hello outshines these apps especially by the features provided by them. Truecaller doesn’t provide the facility of local search but Hello provides the facility. Even though Google Dialer provides the same facility, but seems not as effective as Hello. Facebook has tried to integrate the merits from these two prominent apps and this combination of merits keeps it apart from other competing counterparts. Since all the three are available at free of cost users can test and install the best among these apps which suits you the most.